The white, blue and red colours are those of the British and Russian flags and thus reflect Mr. Hockridge’s ancestry. The red triangular shape with the hawk’s head makes a reference to the surname, a homophone of “hawk-ridge”. The pattern of white and blue is meant to resemble rows of plates (in classic porcelain colours) on display, a reference to Mr. Hockridge’s business, A. W. Hockridge Ltd., which was Toronto’s first china shop and was established by his grandfather in 1900. The hawk and ridge make another reference to the surname. The lily flower was developed by Culver Farms Daylilies, and was named in honour of Mrs. Hockridge’s 60th birthday in 2007. The trillium flowers indicate that the family has lived in Ontario for four generations. 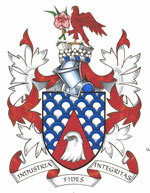 These Latin words means “Industry, faith, integrity”. Two of the armorial symbols are combined with a white disc, known in English blazonry as a “plate”, another reference to the family business. The Arms are differenced with a blue border. The yellow disc in the Arms refers to a coin and thus to his work as a merchant. 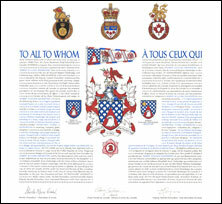 The announcement of the Letters Patent was made on March 20, 2010, in Volume 144, page 439 of the Canada Gazette. Original concept of Bruce Patterson, Saint-Laurent Herald, and Suan-Seh Foo, assisted by the heralds of the Canadian Heraldic Authority.